Southeast Bank Limited published a job circular 2018 for the post of Senior Executive Officer/ Executive Officer/ Senior Officer, Trainee Assistant Officer Grade-I/ II, Trainee Assistant Officer (Cash). Southeast Bank Job circular 2018 published on Prothom Alo newspaper and their official website at www southeastbank com bd. Fresh candidates can apply for this post. Candidates will be face written exam and Viva voice. Here we will update Southeast Bank ltd Probationary Officer written exam result and as well as viva result. Bellow you have to see the details of this new SBL job circular 2018. Online application submit by 20 November 2018. Southeast Bank Limited has built up an excellent reputation as one of the leading banking institution of the country by achieving steady growth in all spheres of banking operations and providing diverse range of products and services to its customers. Southeast Bank Limited is looking for a few young, skillful, creative and self-motivated individuals for the position of “Senior Executive Officer/ Executive Officer/ Senior Officer, Trainee Assistant Officer Grade-I/ II, Trainee Assistant Officer (Cash)”. Academic Qualifications: MBA/ MBM/ Masters in Commerce/ Economics/ Agricultural Economics/ health Economics/ Development Studies/ International Relations/ Public Administration / English/Law / Engineering / Computer Science / Statistics/ Mathematics and Physics with the following SSC result and HSC result minimum GPA 4.00 in a scale of 5.00. Graduation and Post Graduation minimum CGPA-3.00 in a scale of CGPA-4.00. Age : Age not over 30 years as on 31st October, 2018 and Maximum 32 years for the children of freedom fighters. Southeast Bank new and latest job circular published on 16 March in Prothom Alo newspaper for the post of Bank Guard and Gunman. Candidates must be Bangladeshi original citizen and willingly eager to duty and responsible. You have to see the details on the advertisement. Compensation Package : The selected candidates shall be on probation for a period of 2 years with a monthly consolidated salary of Tk. 40,000/- for one year and Tk.45,000/- for the 2nd year. After successful completion of probationary period, he/she will be absorbed as “Senior Officer” with monthly salary of Tk. 60,000/- with other benefits. The selected candidates shall have to sign a Bond on non-judicial stamp valuing Tk.300/- to the effect that he/she shall serve the Bank for a minimum period 0f 3 years after completion of his/r probationary period with certain conditions. Online Application Procedure of Southeast Bank Limited : Interested and eligible candidates may apply online through www.southeastbank.com.bd along with a scanned photography (maximum 20 KB) and all scanned copies of the educational certificates using online application form by 20 November 2018. Only short listed candidates will be called for written test. Here we will update the Southeast Bank Ltd Probationary officer written exam date, time and admit card download system update. So keep in touch to know the written exam result and viva result. Also the final selection candidates list will update via www southeastbank com bd. 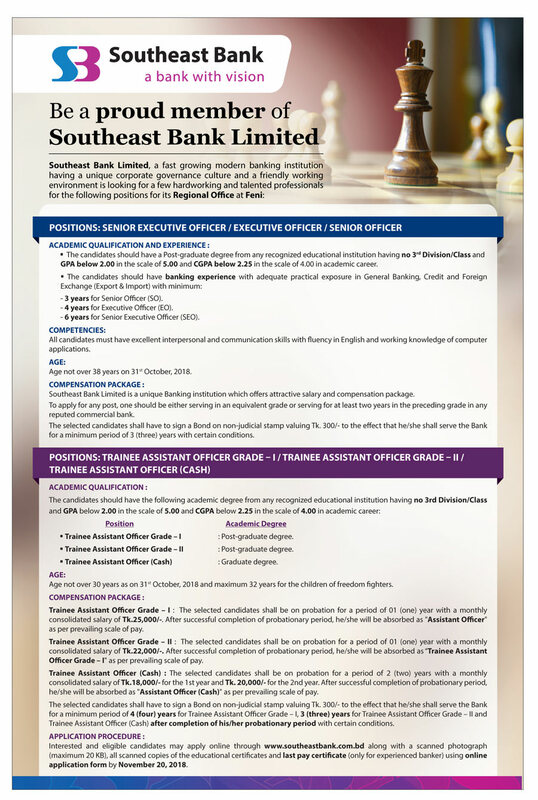 southeast bank admit card. www southeastbank com bd. southeast bank admit card 2017. southeast bank niog. I am searching that position which gives me an opportunity to implement the knowledge that I have acquired and helps me to serve something productive along with acquiring skill and experience. You are welcome to apply if you are eligible for this post.